Pilafi Pligouri (pligoúri), in Greek or pourgouri as it is called in Cyprus, (pr. bour-KHOU-rhee), is a Cypriot bulgur wheat pilaf. Bulgur wheat, is a cereal food made from parboiled groats of several different wheat species but most often from durum wheat. This side or main dish is not only cheap and easy to make but it is also a very healthy meal. Here’s the best part. It’s the fastest dish made from scratch as it only needs 4 minutes to prepare!! Like many other Cypriot recipes, this side dish was considered to be a “poor man’s dish”, as people were poor and made delicious dishes out of humble ingredients they had in their pantry. Bulgar holds a place in recipes similar to rice or cous cous but with a higher nutritional value. Best known as an ingredient in tabouli salad, bulgur is also a tasty, low-fat ingredient (not to mention cheap and healthy), in pilafs, bakery goods, stuffing or casseroles. It is an ideal food in a vegan or vegetarian diet because of its nutritional value and versatility. It is excellent as a meat extender or meat substitute in vegetarian dishes, and is a component of many varieties of meatless burgers found on supermarket shelves everywhere. This side dish is very popular in Cyprus and it goes well with any meat dish. You can make this pilaf with or without the tomatoes, adding more chicken or vegetable broth. If you have leftover roasted meat, such as chicken, lamb or pork you can cut it into small pieces and add it in the pilaf and turn the side dish into a frugal main course dish. Making wheat into bulgar is an ancient process that originated in the Mediterranean and has been an integral part of Greek or Middle Eastern cuisine for thousands of years. Biblical references indicate it was prepared by ancient Babylonians, Hittites and Hebrew populations some 4, 000 years ago, and Arab, Israeli, Egyptian, Greek and Roman civilizations record eating dried cooked wheat as early as 1,000 B.C. Often confused with cracked wheat, bulgar differs in that it has been pre-cooked by par-boiling. This process makes bulgur easy to cook but also has removed certain nutrients from the less digestible outer layers into the centre of the grain, making them more easy to cook with. When I first came to Greece and mentioned bulgur, I usually got some scornful looks from friends and relatives, maybe because it was some of the food they ate during the German occupation and ended being considered as food for the poor. However, after reluctantly trying it they were convinced that it was worth cooking with. 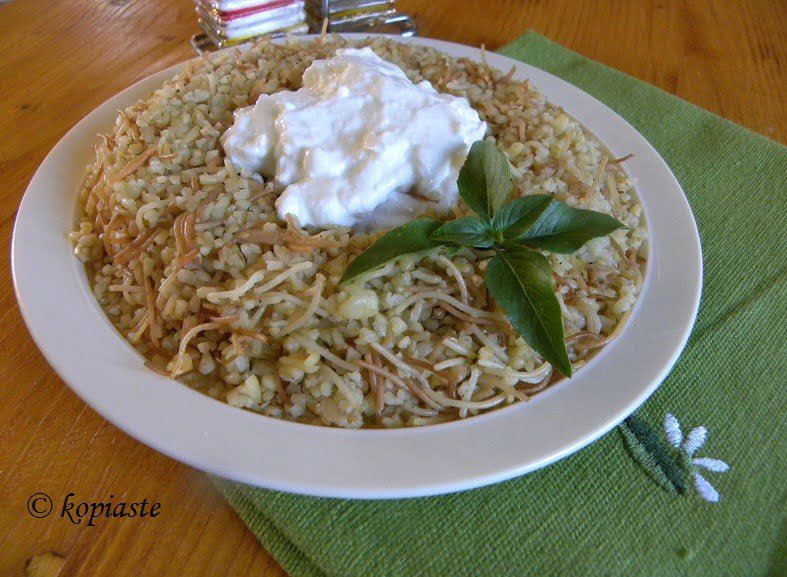 In Cyprus we used to eat bulgur pilaf regularly as a side dish to Afelia. My mother would always make this pilaf when she had leftover meat, lamb, pork or chicken. However a meatless pilaf is equally delicious served with Greek yoghurt. Instead of the meat, I sauté some mushrooms and mix them in the pilaf. She would cut the meat into smaller pieces and mix it in the pilaf and it became our main dish. Bulgar wheat can be coarsely ground, which is the type we use in the pilaf or finely ground, which is the one we use to make koupes, with meat or vegan, which are savory mezedes. Bulgur wheat is also added in Kolokotes or other pies same way as rice is added, to absorb any juices. The pilaf is very easy to make and makes the easiest and most delicious side dish. You need 1 part bulgur and 2 parts water or chicken or vegetable stock. All you need to do is sauté a nest of vermicelli, which you crumble, add the buglur to wet it in the olive oil, add salt and pepper and the broth. This procedure does not take more than 2 minutes. You turn off the heat, place a lid on top and wait for about ten minutes until all the water is absorbed! Piafi Pourgouri is not only cheap and easy to make but it is also a healthy meal. Here's the best part. It's the fastest dish made from scratch as it only needs 4 minutes to prepare!! Heat the olive oil and sauté the vermicelli until it starts to lightly brown. Add the bulgur wheat and mix until it is coated with the olive oil. Add the vegetable stock, stir and bring to a boil. Turn off the heat, cover with the lid and wait for about ten minutes until the bulgur absorbes all the fluid. If you are not vegan, it goes well with some Greek yoghurt. The second recipe is a bit different. Grated onion is sauteed in olive oil and vermicelli pasta is added. Then the bulgar wheat and grated fresh tomatoes, salt pepper and pieces of leftover pieces of meat (optional) are cooked together. The cooked meat is added before adding the fluid ingredients. A very easy, healthy and nutricious main dish made with bulgur wheat and leftover meat. (For the vegetarian dish: Heat the olive oil and sauté the mushrooms. Remove to a platter). Heat the olive oil, add the vermicelli and mix for a few minutes. Before browning, add the grated onion and mix a couple of times. When the vermicelli starts to slightly brown, add the bulgur wheat and mix for a few seconds to absorb the oil. Add the leftover meat or sautéed mushrooms. Dissolve the bouillon in hot water and add it together with the tomato, salt and pepper. Mix until it starts boiling. Remove from the heat and cover the pot with the lid. Let it stand until it absorbs all the fluid. hey you are rocking with yummy vermicelli recipes! Add you as a follower of my blog so that my recipes will be right away in ur dashboard itself! join in the chicken event going in my blog! an award waiting for u in my blog ivy! I do like the look of the fides speckled in the pligouri and mushrooms complement meat so well…bravo! These are two great-looking recipes. It’s interesting that you initially got such a reaction from people regarding bulgur. My father-in-law, who lived through the German occupation, loves the stuff and is so happy when it shows up on the table! I love it that your food has so much meaning & history to it Ivy…makes a handsome mouthful!! Couscous is only available as an impoer here & thus priced quite high. Some time ago I confused it with broken wheat too…I love the dish on the side…it’s sensational!!! The picture is amazing..Looks very very attractive!! I’ve often only associated bulgur with Middle Eastern cooking. Great to see it used like this Ivy. Again, this is a wonderful, informative and well researched post. This dish looks delicious,Ivy. I love all the ingredients, specially bulgur wheat .Is curious to watch the roots of the words. In Spanish noodles are called fideos. Fantastic looking meal, I wish I was eating this right now! The bulger pilaf is interesting, I have never heard of it before. It looks simple enough and is something I would enjoy. Have a good day. That pilaf looks fantastic Ivy and it looks so beautiful all piled up like that! Wonderful presentation! I love bulgar. Although here i see it as more vegan. I love the idea of pairing it with meats and mushrooms. A nice, simple and delicious pilafi, Ivy! Bulgur is so satisfying and I love it as a side (or even as a main). I especially love putting in some fried garlic with it – it just boosts it to a whole other level. This looks like a more wholesome alternative! This looks really interesting. i would never have thought of combining bulgur and vermicelli together. Lovely entry – thank you so much! I found the recipy for the Bulgar/Vermicelli interesting, except no mention was made of the number bulgar to use. If anyone has had experience with bulgar they would know it comes in a FINE, MEDIUM and COARSE. Would like to know which to use. Hi John. I didn’t know that it comes in fine, medium and coarse. Here it comes only in two types: fine and coarse. As you will see above the picture of the bulgur I explain that we use fine bulgar for making koupes and the other type, coarse, for the pilaf. This looks delicious!!!! A great entry to the mingle, thank you! I am desperately looking for a recipe with pligouri, klitharaki, chestnuts or walnuts, white stafides, and I think saute liver w/tomato paste. Any suggestions on how to prepare? Unfortunately, I have never heard of this recipe.